Clear blue waters, beautiful nature and a large variety of seaside fun activities makes Bibione a wonderful holiday destination for persons who like the sea. At the same time, it also provides a lot of opportunities to explore art, culture and architecture in many of the historical small towns around Bibione. Bibione is a holiday town along the Adriatic coast in the north-east of Italy, north of Venice. Thus if you are planning holidays in Bibione, this post is for you. Bibione was a marshy area till 1960s. During 1970s, the marshes were filled and slowly Bibione started to develop as a holiday destination. The first houses in Bibione had come up in the eastern part of the beach, around Corso del Sole and the area that is now known as "Lido dei Pini". Since those early days, the city grew, mainly towards the west in areas called Pineta and Lido del Sole, with hundreds of hotels and holiday homes and is now one of the biggest holiday centres in the north of Italy. Over the past three decades, for our family our annual summer holidays in Bibione are a lovable tradition. The nearest airport is Venice airport about 90 km away. Bibione is connected to Venice and the airport by taxis, boats and buses. The nearest railway station is in Latisana, about 25 km away. Latisana is connected to Bibione by taxis and buses. The bus from Latisana city centre will drop you near the Bibione city centre. Just for staying in Bibione you do not need a car, you can walk every where, though with the expansion of the city, reaching the far end of the new areas in Pineta may need 15-20 minutes of walk. However, if you are interested in discovering the art, culture and history of the neighbouring medieval towns you will need a car. For staying in Bibione, there are a lot of options - apartments, independent houses, residences and hotels. Personally I am not very fond of lazying around on the beach. I did it when our son was small and he used to love the beach, but now I usually go to the beach only for a swim or an early morning/evening walk. However, if you like to spend time on beach, in Bibione you can find opportunities for boat riding and paddle-boat riding. Along the beach, there are also places where you can play a game of bowls or beach volley or badminton. There are also exercise and dance classes on the beach. If you plan to spend lot of time on the beach, you may prefer to rent an umbrella and some reclining chairs. Beach is divided into areas, each with its own distinctive colours of umbrella, managed through a kiosk where you can rent per day, per week or for a month. If you do not mind carrying your own umbrella and chairs, in between, there are many free areas. Apart from the free beaches, there are also areas with umbrellas and chairs where dogs are allowed. For example, dogs are allowed at the Pluto beach in Lido dei Pini. However, Bibione is not just about soaking sun, seaside walks and swims. The surrounding countryside is also good for nature walks and bicycle rides. You will find farmers in the fields, country houses selling fresh vegetables, ducks walking across the path and many horse-rearing places where you can try horse-riding lessons. 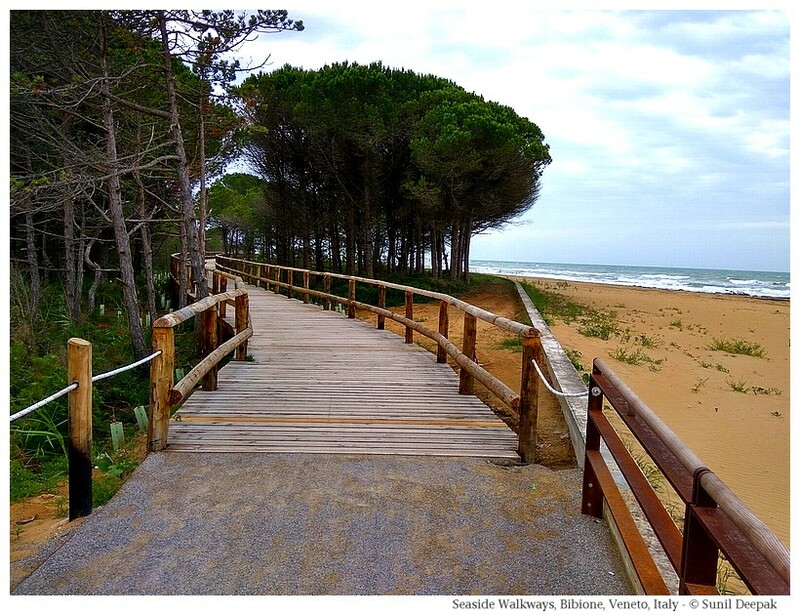 For example, at Lido dei Pini, a new passage has been built along the sea, that passes through a protected forest, and takes you to the lighthouse and Tagliamento river. Similar passages close to the sea are also available near the Bibione Thermal Baths and in Pineta. If you prefer something more adrenalin stimulating, you can try kiting, water-scooters, speed boats, or wind-surfing. Many schools for teaching and renting equipment for the adventure sports and boats are based along the seaside. On the other hand you can also try playing Bocce (bowls) or handball or attending some beach-dance class. Evenings have concerts in the promenade in Piazza Zenith near the sea and some nights have the fireworks displays, usually at midnight. The city is full of restaurants, pizzerias and take-aways. However, most of the restaurants offer Italian cuisine and it is not easy to find places offering Chinese, Asian, African or South American cuisines. There are some really wonderful ice cream parlours in Bibione where you can try some special flavours of the famous Italian ice cream. If you do not wish to go out of the city, you can go for a walk in the city centre, full of shops and amusement arcades for children. Corso Europa, the main central street of Bibione is reserved for pedestrians and is the place to spend a couple of hours in the evening without getting bored. Bibione has a famous thermal bath with qualified staff. You can go there for specific therapies as well as, for massages and rejuvenation therapies. Personally I have not been there, but my wife has been there many times and vouches for this place. Bibione provides some wonderful opportunities for discovering the art, culture and history of the neighbouring medieval towns such as Caorle, Portogruaro, Splimbergo, Redipuglia, Aquileia and Grado. 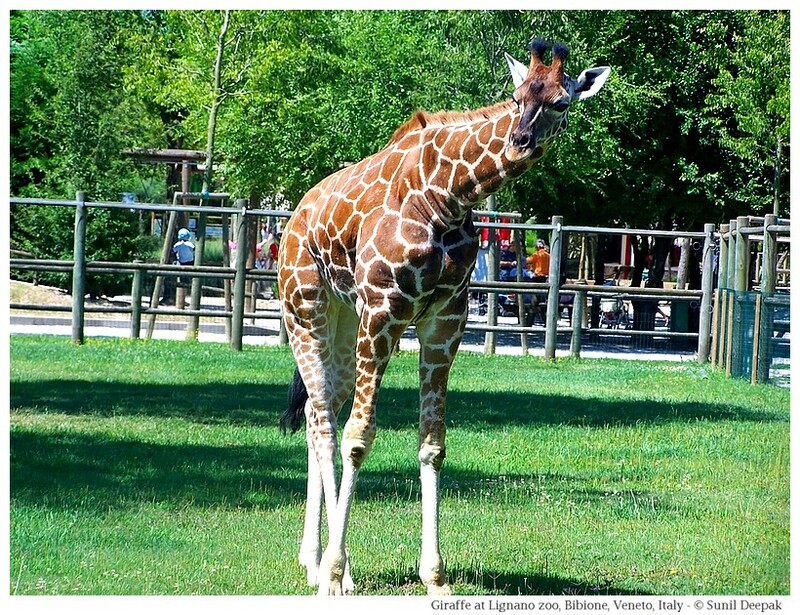 There are also some amusement parks such as Liliput land and the zoo near Lignano. You can also visit Venice as a day trip. You can take a bus to Venice. There are also daily organised one-day tours to Venice from Bibione. Visiting towns like Trieste or going across the Italian border to visit Slovenia, Austria or Croatia, is also possible during a day-trip. Over the past four decades, we have spent so many wonderful days in Bibione, swimming, going for walks and visiting nearby medieval towns during day-trips. In this period, the city has grown and today offers exciting opportunities for all kinds of entertainment and relaxation. Writing this post has been a wonderful experience because it gave me an opportunity to look at a lot of old pictures and to remember the good times we have had there. Another beautiful post. Awesome pics. Beautiful place. I'd love to see it one day! That will be great Parul :) make your plans! The pictures are so soothing and uncluttered, and with to-the-point descriptions, it makes for a very good post. Have a great day! It is one of the destinations that makes me very envious, I keep it in a corner of my head for a little improvised Italian getaway! Thank you for this nice blog!